These ladies went from messy to masterpiece in just 3 hours! Q: How does Sip&Gogh work? A: You'll be taught a step-by-step 3hr acrylic painting from one of our artists and will leave with your own masterpiece! 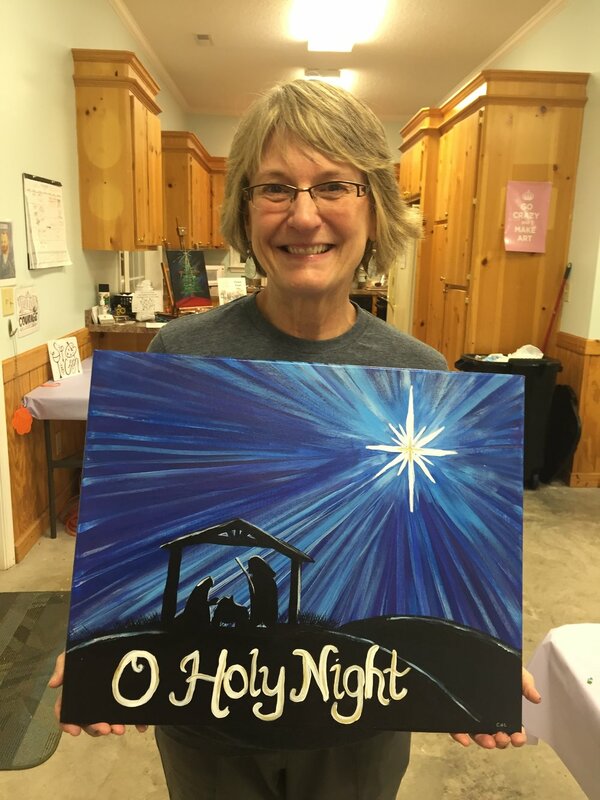 Bring your favorite bottle of wine & snacks and get ready to paint your night away! NO PREVIOUS EXPERIENCE NEEDED! We specialize in beginners and skeptics, we promise. Our calendar makes it easy to find the class you want! You can sign up online at this link by adding the class to your cart and checking out online. We accept all major credit cards. If you would like to pay by cash or check, please call 803.236.1193 to schedule a time to come by the shop to pay for the class. We do not have scheduled normal hours, so please call in advance. The classes fill on a first-come-first-serve basis, so the earlier you sign up, the better! 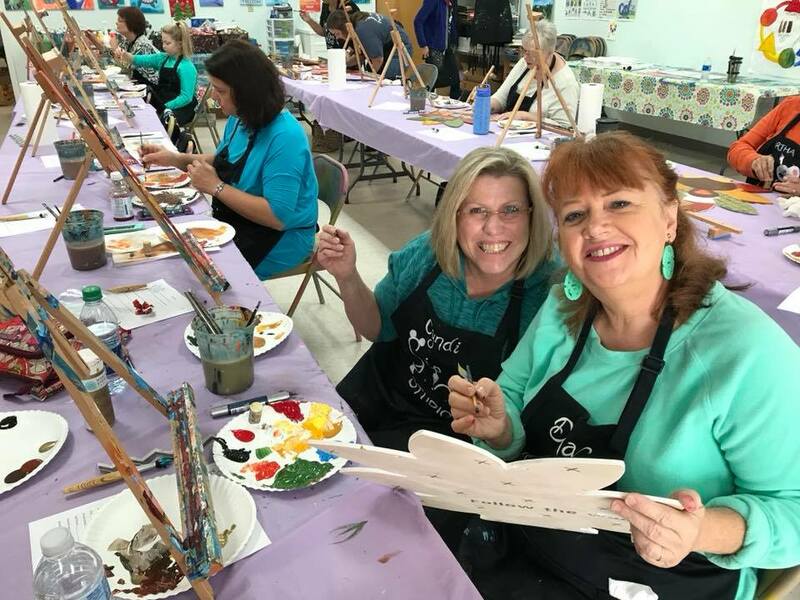 Walk-ins are welcome, but we cannot guarantee that there will be an available easel for you unless you pay in advance. A: Alcohol is welcome! We are a strictly BYOB studio. We do not offer any alcohol for sale, but please feel free to bring your cooler! We have a community table where you can put your food and drinks that you wish to share with the others in the class, or you can keep it with you at your seat. Your choice! We enjoy having a good time here at Sip & Gogh and if you do decide to drink alcohol during the class, we strongly suggest you arrange for a safe trip home! We are happy to call you a cab if needed, just ask! A: Of course! Bring whatever food you like! There is a table to share, or keep your snacks at your seat. Sip & Gogh only provides water, chocolate, and coffee. Kid's enjoying one of our favorite Kid's Canvas Classes! Our client, Cheryl can show you how easy it is to learn! Q: Do I need to know how to paint already? A: Not at all! We are highly trained professionals that promise to take you from beginner to masterpiece in 3 hours. We know that many people have insecurities with their creative abilities and it is our job to teach you skills that will prove to you that you have a lot of talent! We love to see the progress our students make from the first brush-stroke to the final piece. We promise that you will not be disappointed in your abilities! Our class structure is very simple and we follow a step-by-step process (including patterns!) that assists you on your creative process! Q: What if something happens and I cannot come to class? A: We understand that life happens and you may not be able to make it to the class at last minute. If you cannot attend the class, please call 803.236.1193 and let us know prior to the class starting in order to receive a one transfer to a class of equal value within the next 30 days. Please understand that this allows us to give your spot to a potential walk-in client. There is no refund or transfer of class if you fail to call in advance. Sip&Gogh does not offer credit or cash refunds, only transfers to other class offers.